I was out in Gondar to visit Link Ethiopia’s Donkey Library project which my Rotary Club, Weighton Wolds had helped to fund for a year. Whilst I was there I had the opportunity to visit a child I sponsor – Eyerus. I jumped at the chance. I made the short journey across town with two Link Ethiopia staff: I was taken to her school – Felege Abiyot – which has some four thousand pupils. We arrived at her class where the pupils were being very attentive, sitting in rows at metal desks. The 54 students in the class were all bemused to see ferenges(foreigners) peeping around the door!!! The teacher was happy for Eyerus to be excused for the rest of the lesson (along with her best friend Hanna) to show me where they lived. The teacher informed me that Eyerus was a star pupil coming second in class in her last exam. Eyes and Hanna were pleased to meet us, and practice their English as this was their favourite subject at school. They then showed us to their home. It was lovely to see them skipping up the road arm in arm, obviously very content. They wore their simple beige school uniforms. Eyerus lives with and is cared for by Hanna’s parents, as her mother has died and her father is unable to look after her. 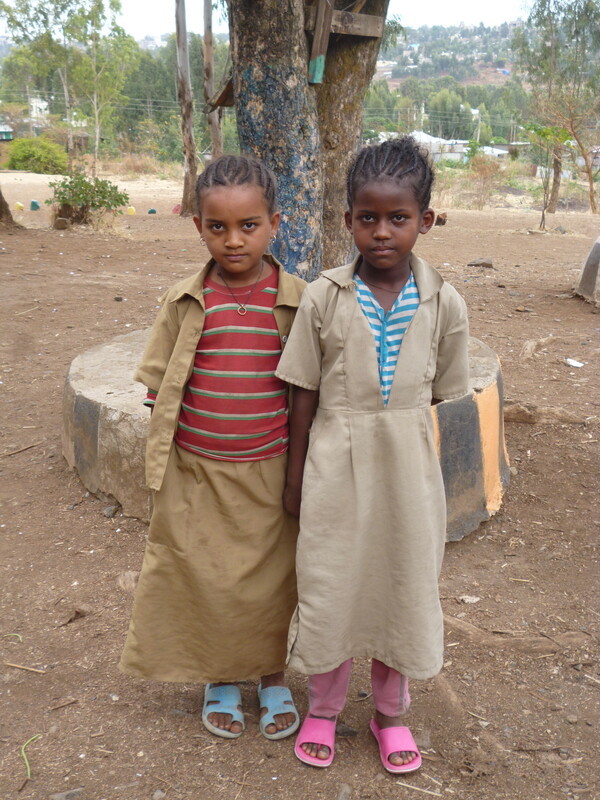 They have taken her in as she was Hanna’s best friend and they have no other children, but the only help they had was the sponsorship through Link Ethiopia. The home was a simple mud and wood, one roomed house with a corrugated iron roof. Hanna’s parents welcomed us in and hospitably made us the usual very sweet coffee. They explained Hanna slept with them on the main bed and Eyerus slept on the floor on a small bed. They had very few possessions but were proud of their home. After about half an hour we all returned to school through a bustling village and the girls resumed their lessons. To sponsor a child feels philanthropic, but to be able to visit was a privilege. Initially, it was good to be able to put a character to a name and a photograph. However it was far more than that: seeing the girls enjoying life and getting the most out of the education that they can get. And also, seeing their parents and teachers being proud of them and helping, basically, out of friendship. A visit I won’t forget in a long time. Yet another occasion of many in Ethiopia where I count my own blessings!